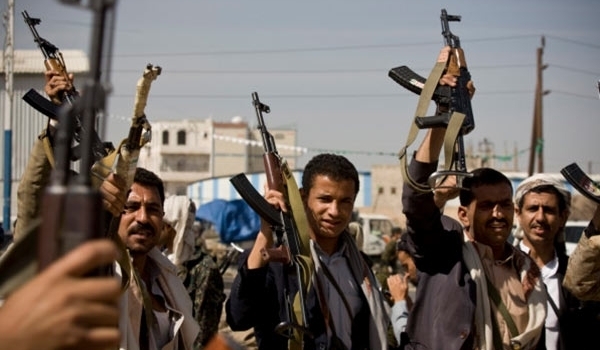 JNN 06 Apr 2015 Sanaa : Yemen’s Ansarullah movement fighters, supported by army units, have gained ground in the southern city of Aden, despite an 11th night of Saudi-led air strikes targeting the group’s strongholds. Ansarullah fighters have captured the provincial government headquarters in the southern city of Aden. An unnamed local official said on Sunday that the revolutionaries reached the central district of Mualla City during their advances and took the control of the local seat of government including the governor’s office. The Ansarullah fighters also made headway to areas near the port of Mualla, which is guarded by militants loyal to fugitive President Abd Rabbuh Mansur Hadi, who has fled to Saudi Arabia. The UN says more than 500 people have been killed in the past two weeks and nearly 1,700 wounded. Residents in Aden say parts of the southern port city have been without water or electricity for two days. According to reports, at least 195 people have been killed and many others wounded so far in clashes in Aden. Meanwhile, Saudi airstrikes have purportedly demolished a bridge linking Aden to the city of Taiz. Ansarullah fighters’ fresh advances come despite Saudi Arabia’s airstrikes against Yemen which started on March 26. Meantime, a senior Ansarullah movement member said Ansarullah are ready to sit down for peace talks as long as Saudi-led air campaign is halted and the negotiations are overseen by “non-aggressive” parties. Saleh al-Sammad, who was an adviser to President Abed Rabbou Mansour Hadi, also told Reuters in emailed answers that Yemenis reject the return of Hadi, who escaped to Saudi Arabia after Ansarullah fighters edged closer to his southern base of Aden last month. UN brokered peace talks in the preceding weeks between Hadi and the Houthis had failed. “We still stand by our position on dialogue and we demand its continuation despite everything that has happened, on the basis of respect and acknowledging the other,” Sammad said. “We have no conditions except a halt to the aggression and sitting on the dialogue table within a specific time period … and any international or regional parties that have no aggressive positions towards the Yemeni people can oversee the dialogue,” Sammad said, without specifying who they might be. Saudi Arabia’s King Salman was quoted as saying on Monday that the kingdom was also ready for a political meeting of Yemeni parties, under the auspices of the Persian Gulf Cooperation Council (PGCC). Five out of the six PGCC member states are part of the military coalition bombing which is bombing the Yemen. Sammad denied that the Ansarullah want control of the south, home to a long-running secessionist movement, and said they were focused on confronting the threat from Al-Qaeda. “The sons of the south will run their own affairs and they will have the more prominent role in the coming political scene,” he said. Saudi air raids continued across the impoverished country on Sunday for the 11th consecutive day. Saudi planes have been dropping weapons to forces loyal to the fugitive President Hadi. Hundreds of people have lost their lives since the airstrikes started, with the UN humanitarian chief, Valerie Amos, saying she is “extremely concerned” about the fate of the civilians. Over two dozen people have reportedly been killed and several others wounded in a fresh wave of Saudi aerial attacks in Yemen, which also targeted a humanitarian aid convoy in the country’s southwest. Witnesses said the Saudi fighter jets on Sunday fired several missiles on two aid trucks that were heading toward the southeastern city of Taiz to distribute humanitarian supplies among crisis-stricken people, Yemen’s al-Masirah satellite TV network reported. Three people lost their lives and nine others wounded in the attack, according to the report. On Friday, the Saudi warplanes airdropped weapons and supplies for the militants, including al-Qaeda terrorists, who are battling the Ansarullah fighters in Aden. The jets airdropped a number of wooden boxes containing various firearms and ammunition in the region early on Friday. Some reports indicated that sophisticated communications equipment and advanced combat medical kits are also among the items. Separately, more than 24 people were killed after Saudi warplanes bombarded a base run by Ansarullah fighters in a region situated between the southern Yemeni provinces of Abyan and al-Bayda, late on Saturday, according to a report published by Yemen-based Arabic-language Wattan news agency. The report added that 21 Ansarullah revolutionaries as well as three civilians lost their lives in the Saudi airborne raid. The extent of the material damage caused by the strike was not immediately available. Saudi warplanes also struck another region situated between al-Bayda and Shabwa provinces. There were no immediate reports on possible casualties. In another development, 20 Ansarullah fighters were killed when militants loyal to Yemen’s fugitive president Abd Rabbuh Mansur Hadi launched a surprise attack on them in the town of Ad Dali’, situated over 280 kilometers (183 miles) south of Sana’a. Four other Ansarullah members were killed in another ambush by pro-Hadi militants in the southern city of Lahij. Saudi Arabia’s air campaign against Yemen started on March 26 without a UN mandate in a bid to restore power to Hadi, a close ally of Riyadh. Meanwhile, the United Nations Security Council met on Saturday to discuss a Russian proposal for humanitarian pauses in the Saudi-led air campaign in Yemen, diplomats said. Russia called for the meeting of the 15-member council amid growing alarm over the rising civilian death toll from the fighting in Yemen, AFP reported. Russia’s request to halt the airstrikes came as the Persian Gulf Arab countries were pushing for a UN resolution that would impose an arms embargo and sanctions on the Ansarullah movement. But the draft text came up against strong opposition from Russia, which proposed amendments to apply the arms embargo to the entire country and to limit sanctions. The UN’s peace envoy for Yemen, Jamal Benomar, flew to New York this week for meetings amid reports that Persian Gulf countries were demanding him to be replaced. Meanwhile, the United Nations says at least 519 people, including women and children, have so far lost their lives in two weeks of turmoil in the country. UN Under-Secretary General for Humanitarian Affairs Valerie Amos said in a statement on Thursday that 1,700 people have been also wounded during clashes between rival groups in Yemen as well as the Saudi airstrikes. The UN official added that 90 children were among the victims of the violence. Hadi stepped down in January and refused to reconsider the decision despite calls by the Ansarullah movement. However, the Ansarullah revolutionaries later said Hadi lost his legitimacy as president of Yemen after he fled Sana’a to the port city of Aden in the south. On March 25, the embattled president fled Aden, where he had sought to set up a rival power base, to Riyadh after Ansarullah revolutionaries advanced on the port. This entry was posted in Middle East and tagged Abd Rabbuh Mansur Hadi, Aden, Ansar Ullah, Saudi Agression, Saudi Bombing, Yemen. Bookmark the permalink.